The Printronix P8010 Pedestal Line Printer prints up to 1000 lines per minute. The flagship model in the series, the Printronix P8010 Pedestal Line Printer is a dependable line matrix printer that delivers maximum uptime and lowest total cost of ownership. It is compact enough to move around in just about any industrial environment. The Printronix P8010 Pedestal Line Printer line matrix printer is presented in a small footprint and is ready to plug into your network and start printing from day one. 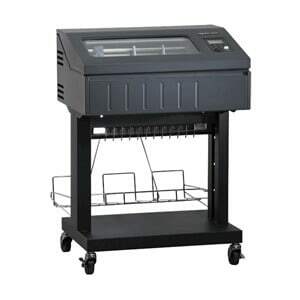 This model boasts a redesigned stand with a built-in input paper tray. You can add an acoustic shroud or adjustable rear tray as paper handling accessories. By adding the optional acoustic shroud, you will enjoy comfortable noise reduction while still having quick access to print jobs. Like all the printers in the Printronix P8010 Pedestal Line Printer, the open pedestal model is ENERGY STAR® qualified. Offered in a wide variety of model configurations and printing speeds ranging from 500 to 1,000 lines per minute, you’ll get more printing done in less time. Compact enough to move around in just about any industrial environment. Optional acoustic shroud offers comfortable noise reduction without impeding quick access to print jobs. Seamless integration into your current workflow will enable you to reap the benefits from the improved reliability, productivity and environmental advantages. Unmatched durability and superior print quality resulting from patented technologies and a choice of speeds to handle your company’s individual printing requirements and challenges. Adaptable Functionality. The Printronix P8010 Pedestal Line Printer adapts to almost any supply-chain or back-office environment. PowerPrint™ delivers improved print clarity and print darkness on multi-part forms by increasing impact energy. PowerPrint is a standard feature on P8010 printers with a 1,000 line-per- minute print speed. Manageable Savings. The P8010 Pedestal Line Printer is a smart purchase.